Hands up who likes writing or updating their Resume? Yep, that’s what I thought – it’s not on the top of many people’s to do list. Which makes it very difficult when you decide that it is time to start applying for a new position or planning a career change. 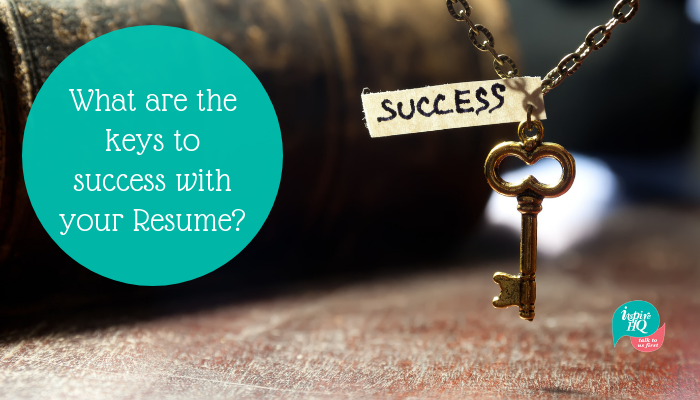 There are a lot of reasons why people find it difficult to write or update their Resume. It could be because it has been years since the details have been updated and you don’t know where to start, maybe you are confused after receiving conflicting advice or you are waiting for someone to help you but they haven’t got the time. What information should I add in my Resume? Personal Details including up to date contact details. You would be amazed by the amount of times I receive a Resume where the contact details are incorrect and I have been unable to contact the person who has applied for a new position. Employment History listed in chronological order with your most recent employment first and working backwards from there. Ensure you include your job title, name of employer and your responsibilities and achievements within each role. A focus on your experience over the last 10 – 15 years is generally enough, there is no need to go back to your first part time job if you have had 10 years of experience in the workforce since then. Qualifications and/or any education and training that you have completed. Skills and attributes with details about how you have demonstrated the listed skills within your previous position. What information should I leave out of my Resume? Anything relating to your date of birth, number of children, marital status, political affiliation, sexual preference, health status, smoker or non smoker are all topics that absolutely do not need to be added to your Resume. How many pages should the Resume be? If you complete an internet search on this question you will receive a multitude of answers. I regularly have people tell me they are trying to keep their Resume to one page which can be extremely difficult if you have been employed for more than a couple of years. In my experience it is more important to focus on providing relevant content to the position that you are applying for, than focus on a specific number of pages. Keeping it to 5 pages or less should give you plenty of space to talk about why you are the best person for the job. Can I have a standard Resume that I submit for all of my applications? When you are applying for positions it is always best to customise your application to the business/ organisation and position. Completing thorough research using company websites, job advertisements and position descriptions will help you understand the role and the type of person the employer is looking for. From this research you will start to recognise key words that can be included in your application. What do I do if I have gaps in my employment? Explaining any gaps in your employment is important to ensure potential employers understand why you have not been working. You may have been on maternity leave, a stay at home parent, travelling or caring for a family member. Whatever the reason, include this information within your Employment History in chronological order so potential employers have the full picture of your timeline. This will prevent them from making assumptions about why you might have been out of work force for any period of time. Should I include a Career Objective and what information should I add? The purpose of a career objective is to gain an understanding of you, your career to date, what motivates you and what you value. It is a snapshot of you and what you want in your career and should match the position that you are applying for. Do I include a list of skills? Skills are a valuable contribution to your Resume when written with detail. It is very easy for anyone to say on their Resume that they have advanced computer skills. To stand out from the crowd you need to demonstrate how you have advanced computer skills, you can elaborate on the types of software packages you have used and what you have used them for. Tailoring the skills on your Resume to the position that you are applying for and including information demonstrating these skills become selling points for you in your application. Is it necessary to include referee details on the Resume? It is appropriate to write “Referee’s available upon request” on your Resume and not list specific details when you are first applying for a position. I would recommend that you have referee details ready to provide to potential employers if you are attending an interview. It is important that you have spoken to your referees to ensure they are happy to be contacted and speak on your behalf. Your Resume is a selling tool for your skills, experience, personal values and motivation for applying for positions. Ensuring your Resume has relevant detail and is tailored to the position you are applying for will increase your chances of progressing to the next stage of a recruitment process. Do you have specific questions about writing applications? Don’t hesitate to get in touch with me.